So we should have saved our Shamrock Shake post for today. St. Patrick's Day, but we didn't....so here's another randomly Irish post. 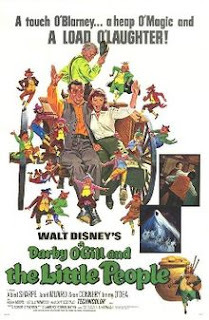 Who out there remembers "Darby O'Gill and the Little People"? It is...not a great movie. I remember it kind of rambling and incorporating a lot of Irish legends and with some hard-to-understand brogues. Sean Connery is in it, though, a young, hunky Sean Connery. Parts of it kind of look like a Lucky Charms commercial. But now that I've kind of dissed it, I have a yearning to watch it again. Ever see this one? Any memories of it? I remember. Saw it at an all night co-ed sleepover in the science lab at school in the seventh grade, about 1980. My teacher had a copy on reel to reel film. We thought it was hilarious!